Claude Lanzmann (French: [lanzman]; 27 November 1925 – 5 July 2018) was a French filmmaker known for the Holocaust documentary film Shoah (1985). Lanzmann was born on 27 November 1925 in Paris, France, the son of Paulette (née Grobermann) and Armand Lanzmann. His family was Jewish, and had immigrated to France from Eastern Europe. He was the brother of writer Jacques Lanzmann. Lanzmann attended the Lycée Blaise-Pascal [fr] in Clermont-Ferrand. While his family disguised their identity and went into hiding during World War II, he joined the French resistance at the age of 17, along with his father and brother, and fought in Auvergne. Lanzmann opposed the French war in Algeria and signed the 1960 antiwar petition Manifesto of the 121. Lanzmann was the chief editor of the journal Les Temps Modernes, founded by Jean-Paul Sartre and Simone de Beauvoir, and lecturer at the European Graduate School in Saas-Fee, Switzerland. In 2009 he published his memoirs under the title Le lièvre de Patagonie ("The Patagonian Hare"). Lanzmann's most renowned work, Shoah (1985), is a nine-and-a-half-hour oral history of the Holocaust, broadly considered to be the foremost film on the subject. Shoah is made without the use of any historical footage, and uses only first-person testimony from perpetrators and victims, and contemporary footage of Holocaust-related sites. Interviewees include the Polish resistance fighter Jan Karski and Raul Hilberg, the American Holocaust historian. When the film was released, the director also published the complete text, including in English translation, with introductions by Lanzmann and Simone de Beauvoir. Lanzmann disagreed, sometimes angrily, with attempts to understand the why of Hitler, stating that the evil of Hitler cannot or should not be explained and that to do so is immoral and an obscenity. On 4 July 2018, his latest work, Les Quatre Soeurs (Shoah: Four Sisters) was released, featuring testimonials from four Holocaust survivors not included in his Shoah. Lanzmann died the following day. From 1952 to 1959, he lived with Simone de Beauvoir. In 1963 he married French actress Judith Magre. They divorced in 1971, and he later married Angelika Schrobsdorff, a German-Jewish writer. He divorced a second time and married Dominique Petithory in 1995. He was the father of Angélique Lanzmann, born in 1950 and Félix Lanzmann who died in 2017, aged 23. Claude Lanzmann died on 5 July 2018 at his Paris home, after having been ill for several days. He was 92. At the 63rd Berlin International Film Festival in February 2013, Lanzmann was awarded with the Honorary Golden Bear. ^ Pascal, Julia (2018-07-05). "Claude Lanzmann obituary". The Guardian. Retrieved 2018-07-07. ^ Epstein, Helen (March 26, 2012). "Fuse Feature: A Conversation with Claude Lanzmann about his memoir, "The Patagonian Hare"". The Arts Fuse. Retrieved 2014-03-04. ^ a b Delacampagne, Christian (2007). "Claude Lanzmann (1925–)". In Reilly, Brian J. The Columbia History of Twentieth-century French Thought. Columbia University Press. pp. 571–72. ISBN 9780231107907. ^ Berry, Meghan (March 26, 2012). "Claude Lanzmann Talks About Shoah, de Beauvoir and His Memoir With Charlie Rose". On Campus. Archived from the original on March 30, 2012. Retrieved 2018-07-07. ^ Dax, Max (2009-06-19). "Israels Feinde machen keine Gefangenen" [Israel's enemies do not take prisoners]. Die Tageszeitung (in German). ISSN 0931-9085. Retrieved 2018-07-08. ^ Rosenbaum, Ron (1999). "Claude Lanzmann and the War Against the Question Why". Explaining Hitler: The Search for the Origins of His Evil. HarperCollins. ISBN 0-679-43151-9. ^ a b Nouchi, Ramck (5 July 2018). "Claude Lanzmann, le réalisateur de " Shoah ", est mort". Le Monde (in French). Retrieved 5 July 2018. ^ Menand, Louis (September 26, 2005). "Stand By Your Man". The New Yorker: Condé Nast. Retrieved December 28, 2017. ^ a b "Nothing he hasn't done, nowhere he hasn't been". Lrb.co.uk. Retrieved 2014-03-04. ^ "Claude Lanzmann se confie sur la mort de son fils Félix, 23 ans". Femme Actuelle. March 2, 2017. Retrieved 2018-07-08. ^ "Claude Lanzmann: an extraordinary prize for an extraordinary man". Vivamost.com. Retrieved 2013-12-16. ^ "Auszeichnung: Claude Lanzmann erhält den "Welt"-Literaturpreis". Berliner Morgenpost (in German). October 2, 2010. Retrieved November 11, 2012. Wikimedia Commons has media related to Claude Lanzmann. Jeffries, Stuart. 'Claude Lanzmann on why Holocaust documentary Shoah still matters', The Guardian, 9 June 2011. 'Witness to History: Claude Lanzmann’s Journey to Shoah, Weekly Standard, 8 October 2012. "Claude Lanzmann Shoah Collection", Steven Spielberg Film and Video Archive, United States Holocaust Memorial Museum (video excerpts and transcripts of all interviews for Shoah, including outtakes). Galster, Ingrid (2011). "'Eine große Qualität meines Buches ist seine Ehrlichkeit.' Postscriptum zu der Debatte um die Autobiographie Claude Lanzmanns", in Das Argument, 290, 72–83. Simone Lucie Ernestine Marie Bertrand de Beauvoir was a French writer, intellectual, existentialist philosopher, political activist, feminist and social theorist. 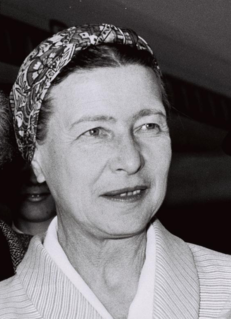 Though she did not consider herself a philosopher, she had a significant influence on both feminist existentialism and feminist theory. Shoah is a 1985 French documentary film about the Holocaust, directed by Claude Lanzmann. Over nine hours long and 11 years in the making, the film presents Lanzmann's interviews with survivors, witnesses and perpetrators during visits to German Holocaust sites across Poland, including extermination camps. Jan Karski was a Polish World War II resistance-movement soldier, and later a professor at Georgetown University. Simone Annie Liline Veil, DBE was a French lawyer and politician who served as Minister of Health under Valéry Giscard d'Estaing, President of the European Parliament and member of the Constitutional Council of France. Die Welt is a German national daily newspaper, published as a broadsheet by Axel Springer SE. 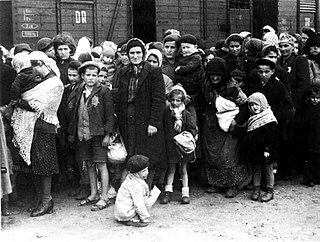 In the decades since the Holocaust, some national governments, international bodies and world leaders have been criticized for their failure to take appropriate action to save the millions of European Jews, Roma, and other victims of the Holocaust. Critics say that such intervention, particularly by the Allied governments, might have saved substantial numbers of people and could have been accomplished without the diversion of significant resources from the war effort. Richard Glazar was a Czech-Jewish inmate of the Treblinka extermination camp in German-occupied Poland during the Holocaust. One of a small group of survivors of the camp's prisoner revolt in August 1943, Glazar described his experiences in an autobiographical book, Trap with a Green Fence: Survival in Treblinka (1992). Szymon Srebrnik was a Polish Jew and Holocaust survivor of the Chełmno extermination camp – a German Nazi death camp established in occupied Poland during World War II. Srebnik escaped after being shot in the back of his head at close range, two days before the Russians arrived in 1945. His testimony along with that of the few other witnesses was critical to prosecution of camp personnel and other Nazi officials, because of the destruction of evidence by the Germans of their mass extermination of Jews in Chełmno. Jean-Claude Pressac was a French chemist and pharmacist by profession, who became a published authority on the Auschwitz concentration camp homicidal gas chambers deployed during the Holocaust in World War II. He was the author of the 1989 book Auschwitz: Technique and operation of the gas chambers among other publications on the subject. Angelika Schrobsdorff was a German writer and actress. Benjamin Israel Murmelstein was an Austrian rabbi. He was one of 17 community rabbis in Vienna in 1938 and the only one remaining in Vienna by late 1939. An important figure and board member of the Jewish group in Vienna during the early stages of the war, he was also an "Ältester" of the Judenrat in the Theresienstadt concentration camp after 1943. He was the only "Judenältester" to survive the Holocaust and has been credited with saving the lives of thousands of Jews by assisting in their emigration, while also being accused of being a Nazi collaborator. Claude Lanzmann: Spectres of the Shoah is a 2015 documentary-short film exploring the life and work of French director Claude Lanzmann. The film was written, directed, and produced by British filmmaker and journalist Adam Benzine. Yannick Haenel is a French writer, cofounder of the literary magazine Ligne de risque.